The state's senior U.S. senator, up for re-election in 2014, steers warily around the state's junior U.S. senator, who has been on a roll for the last several months. Nothing captures the political impact of Ted Cruz’s ascension in American politics like a comparison of public sentiment toward him and fellow Sen. John Cornyn in the wake of last month’s government shutdown. Cornyn’s ratings in the electoral sweet spot where conservatives and Tea Party Republicans overlap have fallen at the same time as Cruz’s have risen. With the shutdown behind him, Cruz’s net favorability (his favorable rating minus his unfavorable rating) among Tea Party Republicans in Texas has risen from +85 to +90, while Cornyn’s have fallen from +38 to +5, according to University of Texas/Texas Tribune polling. While the chatter and occasional name-calling from the far right corners of the Texas GOP has failed to generate a potent primary opponent for Cornyn, Cruz’s role as the standard bearer for Texas (and, increasingly, the national) right wing of the Republican Party has come at the expense of Cornyn and other so-called establishment Republicans. Cruz makes Cornyn look more moderate than his record suggests, and has induced Cornyn, out of some mixture of understandable political caution and more primal political fear, to embrace both Cruz and, more subtly, the junior senator’s political tone and posture. Cornyn is far from alone in this — witness the right-wing crowding among the GOP primary candidates for lieutenant governor and attorney general — but Cornyn’s position epitomizes the Cruz Effect: the reflexive movement to the right end of the ideological spectrum by Republican political veterans motivated by the fear that they will become the next David Dewhurst, suffering defeat at the hands of a Cruz avatar. 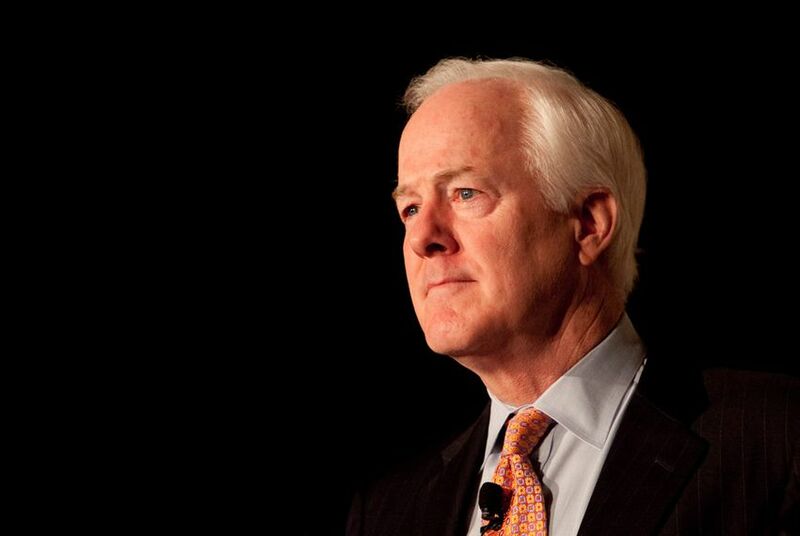 For the most part, Cornyn has navigated Cruz’s prominence deftly. He continues to hold a powerful position among Senate Republicans, and to play the role of the adult in the room, a pose he struck even before Cruz was sworn in. But Cornyn’s decision to distance himself from the Cruz-led government shutdown augmented his image as a member of the Washington establishment, especially among the activated group of Texas Republicans who will soon be passing judgment on Cornyn in the GOP primary. An educated guess based on the Tea Party-related items in the UT/TT Poll results would put this group at about 35 percent of the GOP primary electorate — not a majority of Republican identifiers, and one that is not uniformly distributed around the state; but one large enough, when stirred, to both scare and inconvenience Republican incumbents. We were fortunate (prescient?) in the timing of our two most recent surveys. The June UT/TT Poll was fielded before Cruz’s “faux filibuster” and the shutting down of the federal government. Our most recent poll, in October, went into the field the day after the government reopened, providing a clear picture of how Cruz may very well have benefited from his actions, even as Cornyn’s standing suffered. Among registered voters, Cruz slid from a favorability rating of +9 (40 percent favorable, 31 percent unfavorable) in June to +1 in October. But he emerged from the shutdown imbroglio strengthened among his core supporters. While his favorable ratings among Republicans went down by 3 points and his unfavorable ratings went up by 5 points overall, his favorable rating went up 4 points, from 88 to 92 percent, among the Tea Party contingent. Yet even the astronomically high marks Cruz enjoys among the Tea Party set masks his more telling gains. On the 2016 GOP trial presidential ballot, he went from being the choice of 25 percent of the Texas GOP to 32 percent, and from being the choice of 40 percent of Tea Party Republicans to 56 percent. Cruz’s role in the government shutdown cemented his status as the most popular Republican figure in the state. Cornyn’s approval numbers pale in comparison. His net overall favorability over the same period went from +2 to -5. His favorability among Republicans dropped 11 percentage points while his unfavorable rating increased by 6. Among the same Tea Party group whose support is granting electoral security and political latitude to Cruz, Cornyn’s favorable ratings dropped 15 points to 42 percent, while his unfavorable rating went up a whopping 19 points to 37 percent. The numbers don’t indicate that Cornyn is in trouble. He garnered 39 percent in a 2014 GOP Senate primary ballot with no meaningful challengers. This is by no means a forceful showing for an incumbent senator in a state as red as Texas, and has further fueled whispers of a primary challenge. That said, absent a credible primary opponent, this is no indication of an insurgent movement and the recent David Barton trial balloon floated by conservatives drifted quickly and harmlessly back to earth. There are reasons to think the Cruz Effect is based more on fear than substance. Cruz benefitted enormously from the delayed election and extended primary campaign season that resulted from the redistricting fight in 2012 — so much so that his election might justifiably be seen as a quirk. To the extent that Cruz’s victory is seen as a Tea Party victory, for all its prominence, the Tea Party hasn’t collected the heads of many other incumbents (and probably claims a few that they don’t really deserve). In terms of sheer numbers, the Tea Party has created fear among Republican officeholders mainly through threats of inconvenient and costly primary challenges rather than a demonstrated ability to consistently defeat incumbents. Nonetheless, Cruz now enjoys the image of the leader of a band of crusading conservatives dead set on cleansing the Republican Party — even if they have to burn down the village to save it. At this point in the Tea Party life cycle, this is the underlying power of the Cruz Effect: Its most powerful influence works through discomfort and the opposition’s survival instincts more than through outright electoral victories. This is why one should expect Cornyn, as close as he has gotten to Cruz during the latter’s brief Senate tenure, to get closer still.